(Text automatically translated) At the foot of Mont Blanc, chalet in the traditional Savoyard style, welcomes you for your holiday in a very quiet area (dead), green and surrounded by woods. ! Assuré.Cheminée peace and relaxation and Jacuzzi will be appreciated after your mountain walks A sauna is available in a small chalet indépendant.Un carport is significant for the winter (2 cars) CONSULTZ OUR WEBSITE FOR DETAILS OF CHALET: fermedelagriaz . com. 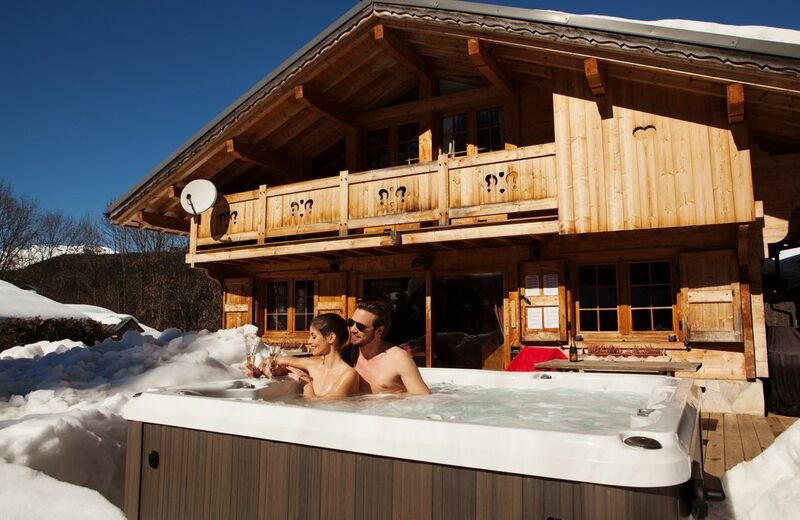 This is a very well-equipped ski chalet, with everything you might want for a perfect stay in the Alps. From the heated boot rack in the ski room to the outdoor jacuzzi and sauna, it was a wonderful place for a week's skiing. The kitchen had everything you might have needed and more. We managed to cook for ten people and all sit down to eat together too. The wood-burning stove ensured we were very cosy in the evenings and there was no shortage of logs to keep it going. Bertrand was a good host, arriving on the first evening to clear the drive and patio of snow and quickly responding to our concerns about hot water. He was also very helpful in response to email enquiries before we left. The chalet has lovely views up the mountain, though it is a steep climb from the main road. As stated in the details, a car is necessary. This was not a problem for us, as we always drive down and like to visit different resorts when we are there. The only small thing that was a little difficult was having just one main bathroom, along with a shower and sink inside another bedroom. This did make for a bit of queuing for a shower in the mornings and evenings. Also, while I know it is fairly standard in France, it is irritating to have to strip all the beds before you leave, especially as we were leaving in the early hours of the morning. I would prefer to pay a little more and not have to strip beds when I am on holiday. Overall, we had a super holiday and I would recommend it. I noticed all your comments and I will try to keep them in mind in order to upgrade my services. I hope to see you again in my chalet the next season. Votre message est très encourageant.Je suis heureux que vous soyez satisfait de votre séjour au chalet.Nous essayons de faire le maximum pour que votre semaine soit la plus agréable que possible. Superbe chalet, tout équipé et très confortable. A recommander ! Merci pour votre appréciation,en espérant vous revoir bientôt. Excelente casa y muy bien ubicada para esquiar en diferentes estaciones, incluso cervinia-zamat y verbier. No le falta detalle a la casa, cocina muy bien equipada y el jacuzzi es una maravilla para despues de esquiar. Casa de 10!!! Excellent séjour pour toute la famille de 4 ans à + 70 ans.... Chalet très confortable et Jacuzzi et sauna ont fait des heureux ! Merci. Merci pour votre sympatrique message,en espérant vous revoir bientôt. (Text automatically translated) Very easy access to 1.5 miles off the autoroute blanche The cottage is located 2 km from the slopes and the ski school French. See our personal website: fermedelagriaz.com.